2016 Scion iA Pros and Cons: Why (Not) This Car? As you might have heard, Scion, Toyota's youth-oriented brand, is in its final model year despite having just introduced two new models. Come 2017 the car I'm reviewing here will likely be sold as the Toyota Yaris sedan, as it already is in Canada. As you also might have heard, the iA / Yaris sedan isn't actually a Toyota. Instead, it's a Mexican-made Mazda2 with a different face. Mazda didn't feel they could sell enough of these small, "B-segment" cars in the United States and Canada, so they gave distribution rights for the sedan (North America doesn't get the hatchback at all) to another company whose brand reputation and larger dealer network give them a better shot. Mazda has kept the related but considerably more expensive (and thus profitable) CX-3 crossover for its own dealers. Since Mazda didn't see much point in selling the iA itself, and the small sedan wasn't enough of a success to save Scion, should you see much point in buying one? The iA's interior is also all Mazda aside from the Scion emblems. Very nicely done for the price. Why the 2016 Scion iA? Since the Scion iA was designed and engineered by Mazda, I expected it to handle well. I was not disappointed. Perhaps to adapt the car for Scion, the iA's suspension isn't quite as firm as that of small Mazdas tends to be, and its steering doesn't feel sharp on center. But bend the small sedan into a curve, and its steering and suspension become communicative and responsive, with minimal understeer, moderate lean, and excellent controllability. With a curb weight just over 2,400, the iA is two-to-three hundred pounds lighter than competitors from GM, Ford, Hyundai, and Kia, and the difference from the driver seat feels even larger. Though not a sport sedan, it's the most agile car in the class, and fun to drive. The Fiesta also handles well, but has noticeably softer tuning and feels a little sloppier in transitions. The Scion iA's light weight also pays fuel economy dividends. EPA ratings of 31/41 with the manual transmission and 33/42 with the automatic (both with six ratios) are best-in-class, with one partial exception. With a turbocharged 1.0-liter three-cylinder engine the Ford Fiesta manages 31/43, but this engine is a $1,000 option and is available only with a five-speed manual transmission. With its standard 1.6-liter engine, the Fiesta manages only 28/36 with a manual and 27/37 with an automatic. In my real-world suburban driving the trip computer often reported averages over 40 mpg, though driving the car like the typical American sunk the average all the way into the mid-30s. On a 70-mph highway with the temperature right at freezing (not ideal) the trip computer reported a two-way average of 44 mpg. Driven with a very light foot, the Fiesta EcoBoost (with the turbocharged triple) can achieve a suburban average in the low 50s, and averages in the mid-40s aren't too difficult. But push the Fiesta and the average will fall into the 30s and even the upper 20s. Fuel economy does tend to vary more with turbocharged engines, as the turbo serves to force more air (and with it more fuel) into the cylinders when this is called for. Most drivers will observe real-world fuel economy as good or better in the Scion iA. Then there's the Mazda3. Though larger and considerably more powerful than the iA, it achieves EPA ratings that are nearly as good, 29/41 with a manual transmission and 30/41 with an automatic. 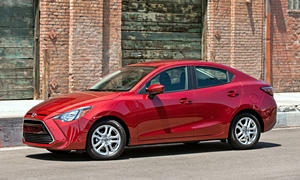 Step up to the truly quick Mazda3 s, with an engine a full liter larger than the iA's (2.5 vs. 1.5 liters), and with an automatic the EPA ratings remain too close for comfort, 28/39. Once the figures get to this level, you tend to give up more in performance than you gain in fuel economy. The iA's fluid lines are all Mazda. Well designed controls, but washed-out tachometer. The glare in the photo was often present. The Scion iA aced its crash tests. With the exception of the Chevrolet Sonic, competitors didn't do as well in the challenging small overlap test. The Versa sedan even scored a poor. Bear in mind, though, that these tests tend to assume a collision with a vehicle of the same weight as the tested car, so their results only apply when comparing cars that are about the same weight. The iA is unique within the class in having a low-speed automatic braking system as standard. In the 12-mph IIHS test, this system completely stopped the iA in time to avoid a collision. It would be nice if the iA also had a standard forward collision warning system and an auto-braking system that operated at higher speeds, but neither is available. You can get the Chevrolet Sonic with forward collision warning, a feature I highly recommend. The iA also has a standard rearview camera. 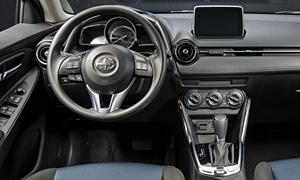 Compared to other small sedans, the Scion iA has a stylish, well-finished interior. Though many surfaces are hard plastic, they don't look or feel cheap. Some interesting textured trim helps. A strip of padded upholstery with blue stitching across the face of the instrument panel, also present in the Mazda CX-3, takes the ambiance up a notch or two. The Ford Fiesta also has one of the nicest interiors in the class, so this one's pretty much a tie. The instrument panels in both the Ford Fiesta and Chevrolet Sonic are overly tall and deep. In contrast, the driving position and view forward in the Scion iA are nearly ideal. Some people dislike the appearance of an infotainment screen perched on top of the instrument panel like an afterthought. But this location places the display where it is most easily and safely viewed without requiring that the entire instrument panel be as high. Why Not the 2016 Scion iA? The iA's exterior styling is pleasant enough until you get to the Scion / Toyota face. When you look at it, what do you see? Though I tested the Fiesta hatch, in this area I'm rating the iA against the Fiesta sedan. I find the Ford Fiesta attractive as a hatchback. As a sedan, not nearly as much. It doesn't wear a trunk well. Sitting behind my 5-9 self in the Scion iA, I have about an inch of knee room, which is an inch more than I have in the Fiesta. While other small sedans don't tend to be much better, the Nissan Versa has a far roomier rear seat. Note that while a car must be nearly the best if not the best in an area to warrant a "why to buy," it doesn't have to be nearly the worst to warranty a "why not to buy," only not good. This face was Toyota's contribution to the iA / Yaris. Mazda supplied the rest. Tight back seat. Also a bit buried due to the upsweeping side windows. Beyond the choice of a manual or automatic transmission, the Scion iA comes equipped only a single way from the factory. While the base equipment level is high for this size car, with alloy wheels, a rearview camera, low-speed auto-braking, and a nav-ready infotainment system, if you want a sunroof, leather upholstery, or heated seats you're out of luck. You can't get these features with the EcoBoost version of the Fiesta, either, but you can get them with the Ford's other engine options (including the 197-horsepower ST). The Scion iA's 106-horsepower 1.5-liter four-cylinder engine feels thoroughly adequate in typical daily driving. Call upon it for all its got, though, and you'll learn it hasn't got much more. The engine has a solid midrange, but not much of a top end. Running from a stop to 60 mph with the pedal to the floor takes nearly ten seconds, a time considered quick back in the 1980s but sluggish by current standards. While none of the other sedans in the class is much quicker, even though some have over thirty more horsepower, the optional turbocharged engines in the Chevrolet Sonic and Ford Fiesta have stronger midranges and feel more relaxed in typical driving, as they don't have to rev as much. The Mazda-supplied automatic is among the best, almost seeming to read your mind with quick yet smooth shifts. I'd still prefer the manual because it provides a more direct connection, making the car seem quicker than it actually is and more fun to drive. The shifter satisfies with solid, precise, relatively short throws, but can make a clanging sound, as if it's bolted directly to the floorpan. A little more refinement wouldn't hurt here. The Scion iA rides more smoothly and quietly than the Honda Fit, with road noise only somewhat loud in the rain (the wheel wells don't seem to be thoroughly insulated). But the Ford Fiesta and Chevrolet Sonic both seem more substantial and quieter (partly because they are more substantial), like more upscale cars. Even the much larger Mazda6 feels like it's lightly built, an agile rather than a rock-solid, insulated car. It's a Mazda thing. The Scion iA's infotainment interface, like that in recent Mazdas, mimics the console-centric systems in Audis and BMWs to good effect. If I was evaluating just this interface, plus the classic three-dial HVAC controls, you'd find "controls and instruments" among the "why to buys." But the LCD tach difficult to read at a glance and often washes out in sunlight. While this isn't much of an issue with an automatic transmission, it is one with the manual. The Fiesta suffers from a Ford of Europe interface that borders on incomprehensible for at least one American. Reliability could easily end up among the Scion iA / Yaris sedan's "why to buys," as other recent Mazdas have tended to be reliable. At this point, though, we have no reliability data on the car. The Ford Fiesta hasn't had a good reliability record. A major source of problems can be avoided by getting one with a manual transmission. Scions have no factory options other than the transmission, only dealer-installed accessories. So an iA's pricing is simple: $16,495 with a manual and $17,595 with an automatic. Want nav? You can purchase an SD card for about $400 from either Mazda or Toyota dealers (the latter's price is a little higher). Competitors can start well below the iA, but once similarly equipped usually end up in the same ballpark. A Ford Fiesta SE is $300 less than the iA with its base engine, and $695 more with the more efficient, torquier turbo three-cylinder. The Fiesta also has about $400 in additional content (including automatic headlights, a leather-wrapped steering wheel, a CD player, an armrest, and floormats). The Nissan Versa is an exception. Only in its base trim, which is priced $3,680 below the Scion, is the Versa offered with a manual transmission. Equip the iA with an automatic, and the mid-level Versa SV is $1,240 less, with about $300 of the difference attributable to content differences. Also factor in that Scion dealers employ "pure pricing." Prices can be discounted from MSRP, but the same discount is offered to everyone, with no room for negotiation. Owing to this policy, the actual price difference has tended to be larger, which does a lot to explain why the Versa is class best seller. The real challenge, though, comes from the larger and much more powerful, yet nearly as fuel-efficient Mazda3. The Mazda lists for $2,170 more, a significant amount, but you get a lot more car. Mazda itself didn't think the Mazda2 / iA would do well in the same showroom. Since it has been annouced that Scion is in its final model year, dealers might be discounting them more. When the iA is rebranded a Toyota next year its price will be negotiable. I don't expect resale values to be affected much. Pontiac Vibes remain in strong demand because they're widely known to really be Toyotas. The Scion iA isn't the cheapest, quickest, roomiest, or most luxurious small sedan. But it is the most agile and fuel efficient, has a well-designed interior, and should be reliable. For someone seeking a fun car with a low total cost of ownership, it's a very strong contender. But if you have another $2k to spend, you should also consider the larger and more powerful yet nearly as fuel-efficient Mazda3. Decent power for typical daily driving, but not much in reserve. Efficient. Trunk about average in size, 12 cubic feet. Rear seat folds in two sections. Scion provided an insured car with a manual transmission for a week with a tank of gas, an earlier iA with an automatic transmission at a regional media association event. 2016 Scion iA pros and cons, according to Michael Karesh: the best reasons for buying (or not buying) the 2016 Scion iA. Join TrueDelta to post your own impressions. How about the sound and feel of the engine? Does it feel eager to work, or more like hate it's existence? Neither, really. Nother notably objectionable or praiseworthy about the sound of it. As noted in the review, it feels fairly torquey in typical driving, but push it harder and there's not much more there. I didn't run it to the red line for thrills. Toyota has managed to handicap Mazda's distinctiveKodo design language with a carp-faced visage that to my eyes is a cut and paste design travesty. Juxtaposed against the current Toyota Yaris, the Scion iA is an improvement of truly epic proportions and perhaps that's the best comparison to help appreciate what an asset the iA brings. A key point concerning Mazda's decision to provide the Mazda 2 to Toyota is that Toyota's projected volumes of 50K/yr.provides Mazda with instantaneous capacity utilization for their new Salamanca plant. Michael, I'm surprised to see you rate the powertrain as only even with the Fiesta. Since most buyers buy automatic, wouldn't the Fiesta's inferior automatic transmission performance give the Mazsciota the edge? I rate the cars that were tested, in this case with manual transmissions.